Think Australia’s Got Talent, and you’ll have a fair idea of what Megastar, the online talent platform owned by MSM Corporation (ASX: MSM) is trying to achieve – without limiting itself to the confines of television network constraints. 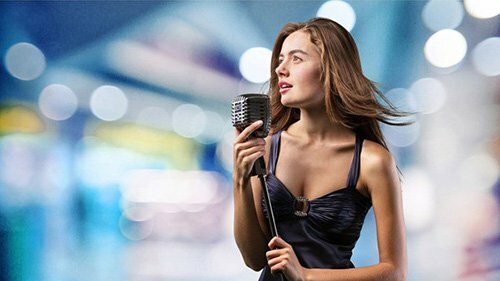 Set for launch in next quarter, Megastar is the $1 million online talent competition that will feature amateur performers across a wide range of categories: musicians, singers, athletes, comedians, extreme sports, performance artists, dancers, quick-draw artists essentially any genuine talent a person might have. Former Google data scientist Roman Sharkey was also swooped up by MSM recently as Chief Data Scientist. Megastar has set itself up to have a much broader online reach than network television can deliver, with performers to post videos for audiences to view, comment, promote and react to. You may think that’s what happens on YouTube, but YouTube is a fame lottery, whereas MSM provides a platform to potentially accelerate the careers of every single auditioning artist: they come in with a minimum of 2000 followers and could leave with hundreds of thousands. Remember though that this is still an early stage tech play and caution should be adhered to in any investment decision you make. In effect every participant has the potential to build an audience, even if they don’t come away with the million dollar prize. MSM is in talks with a series of film, music and social celebrities, all of whom will feature heavily in its media campaign. Of recent note is the partnering with DanceOn , who has been appointed to Megastar as a social influencer to amplify awareness of the upcoming competition. 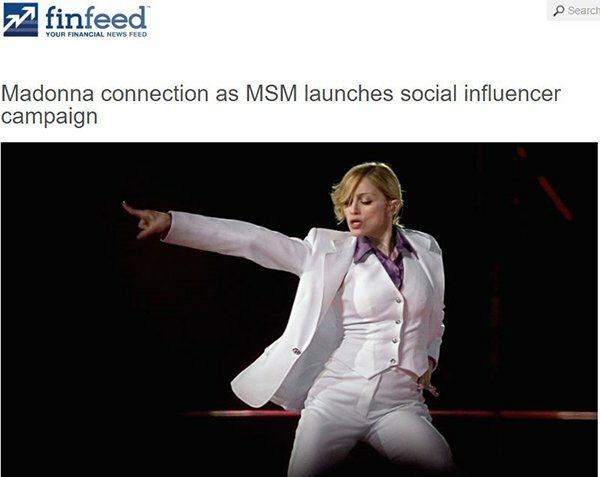 DanceOn is a global programming brand with 8.5 million viewers across social media and ties to none other than Madonna. The Like a Virgin , Vogue and Holiday megastar singer and sometime actress was the co-founder of DanceOn, bringing MSM even closer to megastar celebrity before take-off. DanceOn is one of the internet’s largest digital communities of influential dancers with a global audience of over 100+ million viewers across mobile, web and streaming platforms. So, as you can see, the numbers relating to the soon to be released MSM platform are adding up. MSM has a massive partnering network with ROAR giving it access to A-list celebrities, ToneDen offering access to 475,000 DJs or content creators (up 90% since December 2015), with thousands of unique followers and Digital Riot offering the top 12 contestants the chance to be in Hollywood movies. Early indications are that MSM is ready to pick up a large swag of contestants and audience members. Should the initial Megastar launch go as expected we could see it become a seasonal competition that gives the talent quest majors something serious to think about. MSM Corporation International (ASX:MSM) is on the precipice of having the world’s largest online talent competition through its Megastar platform. This is not a platform for which the most votes win. In fact, votes only take you so far, but virality and interactivity could take you all the way. Just ask Australian comedy trio SketchSHE – now the first hosts of the Megastar competition – about the importance of virality. The trio know a thing or two about making the most of online celebrity, with over 100 million views globally and a track record of their comedy sketches going viral. They also have a substantial social media following reaching well over 3 million followers across their YouTube, Twitter, Facebook and Instagram social media channels, which will be leveraged throughout the competition. SketchSHE is the first in line to join as hosts, as MSM continues to make significant progress to secure A-List celebrity talent to judge and promote the show. Whilst it’s too early to make exact predictions on viewership numbers, based on millions of viewers engaged in shows like Idol , X Factor , The Voice , etc. you get an idea of the kinds of numbers Megastar could attract. Regular Next Tech Stock readers would have been following MSM since back in January 2016 – that is when our first article on the company So You Want to Be a Star? New ASX Tech Play Brings Profitable TV Format Online was released. 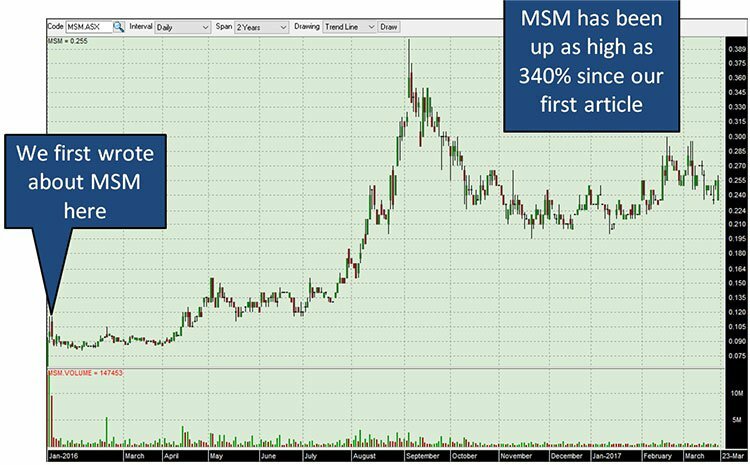 With a current market cap of a shade over $100 million, the upside potential for MSM should Megastar become anything close to the likes of the $2.5 billion American Idol franchise could be considerable. This is speculation of course and MSM is some way from repeating American Idol’s success, so don’t base your investment decision on this fact alone and seek professional financial advice. Being the world’s biggest online talent competition is bound to bring attention to MSM. MSM’s revenue strategy involves a pay to play and subscription model enhanced with cost per engagement advertising and big data analytics revenue in the longer term. The long-term monetisation techniques will be employed after the competition launching, as the primary goal in the initial stages is to gain traction in the market. Once a large audience is acquired and hype about the competition spreads, the cost per click advertising will be switched on. The American Idol season that wrapped up last year was the show’s final airing . After 15 series, the show was cancelled as ratings for the TV based talent show declined in line with the fall in TV ratings in general. The demographic leading the trend is the 18-24 year olds, who are quickest to adopt online alternatives, further playing into MSM’s hands. The timing could not be any better for MSM’s Megastar as this paves the way to market without any major competing talent shows. Here is CEO Dion Sullivan discussing the coming launch and the market objectives. Whilst the widely successful American Idol is valued at $2.5 billion, the show could not capture the surge in online participation. Megastar on the other hand is able to access this market and have people from all over the world go head-to-head against each other, likely increasing both participation and viewership. We’ve all seen people share viral videos on social media, now MSM has found a way to monetise that directly and deliver it to an engaged global audience. The future of video advertising is on social media, and Megastar finds itself sitting in the sweet spot with the significant emerging market opportunity existing in the mobile gaming market. Year-on-year the amount of hours spent by users on YouTube increases by 50%, with 6 billion daily video views on Snapchat and 8 billion on Facebook. This means the Megastar platform is placed directly in the hottest area of the digital advertising space. Brands are increasingly investing in reaching customers where they are , mobile and social and MSM is looking to capitalise on this trend. The highly disruptive, first-to-market platform will monetise mobile video via the Megastar talent competition format – operating squarely within the US$25 billion online gaming and US$30 billion mobile sectors. 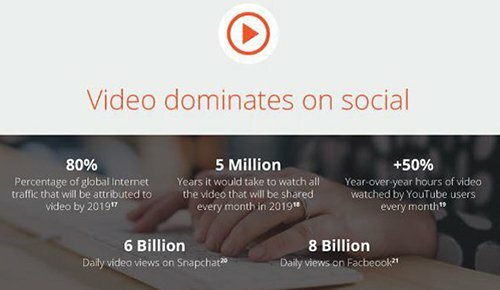 A report by Cisco found that by 2019 video media will account for 80% of all global internet traffic, with a million minutes of video being shared every second. Thus Megastar could become a platform for non-stop viral content to be uploaded making it a medium that advertisers will want keys to access. Of the $100 billion worldwide mobile ad spend predicted in 2016, 51% will be in the digital market space. Suffice to say, the mobile ad market is exploding and MSM is about to attract some of the most share worthy content on the internet. Last year a quantitative research study was completed by Hub Entertainment Research, a well-respected industry research company, with preliminary results coming back extremely positive, with 83% of respondents finding the Megastar concept ‘appealing’, and 43% finding it ‘very appealing’ . 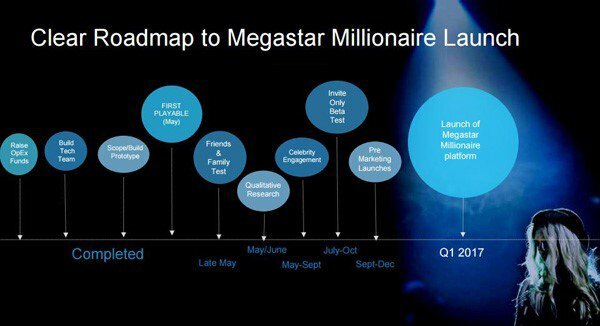 Rigorous and statistically significant testing was undertaken that indicated the enormous commercial upside potential of the Megastar platform. Over 2500 active social media users are 15 to 45 years old, equally split between men and women took part in the independent research. The results were gathered through a comprehensive survey conducted between May and June 2016. The research set out to identify avenues to optimise the Megastar platform and maximise its value. 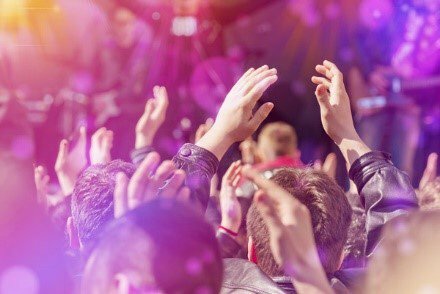 Specifically in examining the appeal, willingness of users to pay for participation and core drivers that will build the success of the Megastar competition. Concluded from the research was a strong user willingness to pay US$62 (AU$82.95) to participate, far exceeding internal MSM forecasts. 83% of respondents found the Megastar platform appealing, 43% ‘very appealing’. 54% of respondents were ‘very interested’ in being a fan, and 39% were also ‘very interested’ in being a super fan. 24% were ‘very interested’ in being a performer’. The global nature of the competition was a key selling point for the respondents. Offering prizes to fans gave them a stronger incentive to participate in the competition. Closed Beta testing was completed in October last year , following a 30-day competition that involved 3000 participants, including performers and their fans. Lasting over six rounds, including a grand prize of $10,000 for the winner, the competition was hosted by YouTube celebrity Chelsea Briggs , proved a roaring success. The positive results not only validated the commercial aspects of the platform, but also placed MSM in a strong launch position as it prepares to go out to the world in the coming months. Following Beta testing, MSM initiated an open audition process; a series of smaller test tournaments which allow the development team to refine the platform’s metrics and features. Participation was almost double that of the Beta testing and has really prepped the company for its imminent launch. Building on their industry leading personnel, MSM has teamed up with relevant partners to leverage the reach of the Megastar platform. ToneDen is one of the Internet’s foremost and progressive music growth communities with prime focus on artist-fan interaction. In Q4 2015, ToneDen recorded more than 250,000 registered accounts and reached over 2,000,000 registered ‘fans’ compared to 100,000 in August last year. That works out to around 13% growth month-on-month – and MSM is part of it having agreed a closely collaborative partnership. The most recent figures released by ToneDen show that it has risen to 475,000 content creators, up 90% since December 2015 . The fact ToneDen has seen bullish growth in artist numbers indicates that it is adept at building a community of artists – something that MSM could well and truly capitalise on. Digital Riot Media will cast the winner of Megastar in a film(s) and provide ongoing distribution support to drive the brand. Digital Riot Media is looking to produce movies with digital media stars, and then distribute them through online platforms like Netflix, iTunes, Amazon and others. Upcoming projects feature well-known YouTube, Vine, and Instagram personalities along with traditional TV and film stars. Digital Riot has 12 online films in the pipeline, with the first set for release in September 2017. Importantly, the company launched a ‘direct to fan’ online film titled FML . The cast of the film has a cumulative social media following of over 60 million people, with the film distributed via iTunes, Google Play and Amazon. The success of this film could be a taste of things to come for Megastar participants, who don’t have to wait long now for their chance at fame and fortune. ROAR is a talent, music, and brand management firm with expertise in overall career strategy, guidance, execution and business development, strategic partnerships and marketing initiatives. ROAR’s connections in Hollywood are important in MSM gaining traction with the right executives and studios in the entertainment world. The MSM team is now hard at work building momentum behind the Megastar platform. In conjunction with its partners, MSM has engaged its A-list talent and influencer network to amplify reach and adoption. It is also in discussion with potential international licensees. What may help in its international marketing thrust the launch of the social influencer campaign which will include 14 dancers from the dance focused digital entertainment company, DanceOn, appointed as the first social influencers to amplify awareness of the upcoming Megastar competition. As we alluded to earlier, DanceOn was co-founded by American singer Madonna, and is a digital first program for dance entertainment with one of the largest Internet communities and a global audience of more than 100 million viewers across mobile, web and streaming platforms. How MSM is able to leverage this is speculative and its growth on the back of this partnership remains to be seen. Investors should seek professional financial advice for further information if considering this stock for their portfolio. The announcement of further social influencers is imminent, and given that there are a number of categories including comedy, extreme sports, magic, variety and singing we could see prominent prominent figures from various walks of life all promoting the MSM platform. With development well underway the Megastar platform has now been Beta tested and begun its marketing campaign ahead of its unveiling in Q2 2017. 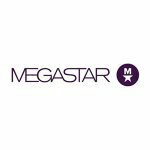 Megastar has growing numbers through its partnership with ToneDen and DanceOn and marketing and celebrity engagement is set to follow in the lead up to the competition to build excitement and awareness. In the online social world that we now live in, people want validation and reciprocation, the MSM platform allows fans and artists to interact, with all artists encouraged to build their own profile. This has been made easier by taking a proven successful concept of talent shows and combining it with online media. In doing so, MSM has a first mover advantage with no direct competition to take away any limelight. With shows like American Idol and other TV based talent shows losing out to online media, MSM could be on the verge of being the biggest online talent show in the world. With the desire for people to get their 15 minutes of fame, potentially win $1 million and the technological shift towards mobile media, Megastar will have an endless global talent pool to provide content for years to come. Get ready, as the countdown to the launch of Megastar has begun!